by-laws, Health & Safety Document 63S (The Electricity at Work Regulations 1989), IS 813 (Eire) and other local requirements. Where no specific instruction is given, reference should be made to the relevant codes of Practice. system must be approved for use with potable water supplies. as measurements, wiring diagrams and installer menus. 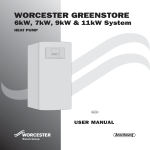 This manual provides all the information necessary to install the heat pump. recommended installation sequence. Use the supplied checklist during installation. 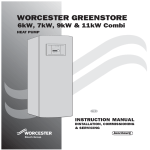 Installation of the heat pump should be performed by a qualified installer. If the heat pump needs to be tilted during transit it may be temporarily tilted with the compressor downwards. However, never lay the heat pump down or transport it horizontally. Heat pump installation and collector installation must be carried out in accordance with applicable regulations. Stand the heat pump on a flat surface. Adjust the height using the rubber feet. the drilling company). Check that the horizontal collector (if fitted) has been installed correctly. 3. 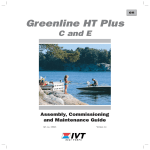 Fit the incoming and outgoing pipes for the heating and heat transfer fluid circuits as well as the expansion tank. 4. Fit the particle filters and valves. 6. Install the outdoor sensor and a room sensor if used. 7. Fill and vent the primary and collector systems before commissioning. 8. Connect the heat pump to the electrical system via an external isolation switch. Use the appropriate wiring diagram. 9. Connect a general alarm and external control if used. 10. Commission the heat pump by making all the necessary settings on the control panel. 11. Check the heat pump after commissioning. Top up the collector system if required. required for installation and servicing. and behind the heat pump. pump is moved without using the supplied pallet. The heat pump must not be stored at temperatures below -10ºC. The temperature surrounding the heat pump must be between 0ºC and 35ºC. The installer should take sound insulation into consideration when positioning the heat pump. this value the heat pump will stop for safety reasons. 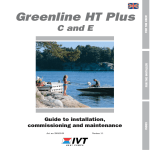 can operate at inlet temperatures down to -5°C, lower inlet temperatures are not recommended. The preset values can be changed during commissioning. incoming pipe of the collector circuit. The filter should be fitted as close to the heat pump as possible and placed horizontally. The filter for the primary circuit is already fitted inside the heat pump. type PEM 40 x 2.4 PN 6.3. SDR11. should follow applicable material and working descriptions and regulations. objects that can damage the collector hose. system. Dirt and debris can cause a blockage in the heat pump. bend, it can be repaired by using a straight coupling. through a wall. The soil filling around the hose must not contain stones. Collector, PEM 40 x 2.4 PN 6.3.
closer than 800 mm to each other. coil. The coils should have the same length. connected to the outgoing pipe. more about filling under the headings Connecting the heat pump to the heating system. (see the figure to the right). venting process. Trench measurements: depth: 1 - 1.3 m, width: 2.5 m.
Minimum distance between two rows of compact collectors is 1 m.
digging must adhere to applicable regulations. collectors on the ground before they are positioned in the trench. filling with heat transfer fluid. Reduce to 2 bar when backfilling. 5. Refill using sand or soil without stones. 6. Route the return line, 40 mm PEM, at a depth of 1 m.
pipe material must be used when routing the pipes indoors. can be installed in each row. heat pump. Flushing protects the heat pump from contamination. when the return differential temperature exceeds 13ºC. pump should be connected using a bypass and an external main pump G1 (P1). Hot water production is started by the hot water sensor T3 (GT3), and is stopped by the return sensor T9 (GT9). The circulation pump G2 (P2) is a Wilo Star 25/6-130. heat is once more supplied to the heating system. combination of radiators (higher temperature demand) and underfloor heating (lower temperature demand). influenced by a room sensor. A room sensor is supplied as standard with the heat pump. the year. Thermostatic valves must remain fully open in order to ensure this. above is possible, a 100 litre primary water storage tank should be fitted. The length of the bypass should be at least 10 times the inner diameter of the pipe. Symbols according to ISO/FDIS 14617. Letter codes according to IEC 61346-2. This is a principal drawing. the heating system is inadequate, for example with one or two fan-assisted radiators. 2. Vent the system and refill to the correct pressure. glycol and water is recommended. The freezing point should be approximately -15°C. table 1 and 2 for correct mixture. 200 x 0.71 litres of water/ metre = 142 litres of water. 3. Set the valves on the filling link in filling mode. 4. Set the valves on the filling pump in mixing mode. 5. Start the filling pump to start mixing heat transfer fluid in the barrel. collect these litres in a separate tank. 10. Set the filling link in normal operation mode and stop the filling pump. Two male G20" to G25"
to avoid interference on the sensors. performed by a qualified electrician. Wiring diagram is supplied with the heat pump. A description of external connections is given in this section. must comply with current electrical regulations. place of the two separate devices. approximately 1-2 m from the heat pump and, if possible, after a 90° bend. least 50 cm from ground level. connection to the heat pump. Install the Room sensor T5 (GT5) in a room in the center of the house. The power supply is connected to terminals L, N, and Earth. pump is connected to terminal P1. Must always be connected. Connect to terminal GT1. Must always be connected. Connect to terminal GT2. GT3 X on the terminal block. Is connected if room sensor influence is required. The general alarm is activated irrespective of which alarm has occurred. output carries no current and it closes at a general alarm. Connect max 24 V and 100 mA on the contact. available from menu 5.7 (Select external controls). contact must carry no current. The softstart reduces the compressors starting current. the menu button for approximately ten seconds. automatically returns to Customer level 1.
is intended for use only by installers. The Installer level also includes Customer levels 1 and 2. SERVICE is shown on the menu display. Press the Menu button again. 2. The menu display Indoor temperature settings (menu 1) is shown. for installer (menu 5) is reached. Now press the Select button. (menu 5.13) is reached. Now press the Select button again. have been connected by pressing the Confirm button. setting is being registered in the heat pump. 7. When the setting has been registered the previous menu display is shown. Press the Return button twice to return to the main menu again. before back filling with earth. fan-assisted radiators are opened fully. Therefore read the entire documentation before commissioning is started. pump returns to normal mode. pump for the first time. the text Access = SERVICE is shown on the menu display. symptom under the heading What to do if a fault occurs. 5. Make the necessary settings on the control panel. shown if the sensors have been confirmed. handle the maximum electrical output. On delivery the control unit is set to 2/3. provides an additional 3kW, 2/3 provides 6kW and 3/3 provides 9kW. Set the hysteresis for heat pump on/off switching on the return sensor T1 (GT1). be avoided when using regular radiators. For underfloor heating 3-4°C is recommended. Set the neutral zone for the mixing valve in a heating system with two heat curves. applies when the sensor T4 (GT4) is connected. the value is 60ºC. Only applies when the sensor T4 (GT4) is connected. 2)/Timer control about how to set the control unit. within 20 seconds. The setting must be repeated each time a fast restart is made. Fast restart of the heat pump, to allow the cooling circuit time to equalise pressure. 0 : No effect (factory setting). 1 : HP, electric heater and hot water stop. 2 : HP no effect, electric heater and hot water stop. 3 : HP and hot water no effect, electric heater stops. 4 : HP and electric heater no effect, hot water stops. Select the language required for the menu texts. The default is English. pump starts and stops with the compressor. always start and stop with the compressor. Select this menu to see the version number of the control unit. heating or hot water demand. its own. On delivery the timer is set to one hour. more information under the heading Technical information. from Installer / Service level are reset. When the heat pump has been installed in a newly built house with underfloor heating, the Drying for floor screed function can be used. works during drying operations with the hysteresis set in the display 1.4.
and is not affected by timer controls. Set how many days you want the heating phase to last. Set how many days you want the cooling phase to last. Set the start and stop temperatures for the drying program. Set the maximum temperature that the drying program should work at. The function is activated and deactivated here. Drying program. this circuit is to be included in the drying program. heating water and the domestic hot water (DHW). short period of operation it may be necessary to top up the heat transfer fluid. with cold water if necessary. The heat pump requires a minimum of maintenance, however, it is recommended that the heat pump is checked annually by a qualified installer. sight glass and filter. The front cover is secured at the top by two screws. 2. Tilt the front cover forwards. 3. Lift the front cover up to release the lower edge. contact the customer service department. unscrewing the screws on the top. fitted inside the heat pump. 1. Disconnect the heat pump from the mains electricity supply. 2. Close the valve and unscrew the sealing cap. 4. Lift out the filter from the valve and wash clean with water. 5. Refit the filter, the circlip and sealing cap. 6. Open the valve and start the heat pump. below the minimum level of 1/3 of the volume in the vessel. The heat pump must be operating all the time while filling. 2. Check that the valve is fully open (figure 2). 4. Close the valve and refit the plug (figure 4). support in case of repeated alarms. Time when the alarm occurred. possible actions to rectify the alarm. the menu dial clockwise for more information of each alarm. Possible cause 1: Power failure in the property consumer unit. 1. Check the fuses in the property consumer unit. circuit breaker. Change the fuse if necessary. pushing up the centre toggle switch. Reset for motor cut-out on compressor. appear in the menu display are described on the following pages. buttons on the heat pump as shown in the diagram above. Intermittent fault or overload on the power supply. 1. Press the Ackn. button. 2. Reset the motor cut-out on the heat pump (Fuse 1). 3. Wait for the heat pump to start. 1. Contact the Technical Support Department. Possible cause 4: Compressor error. Possible cause 1: The HTF pump is blocked due to contamination. 2. Loosen the vent screw and remove the dirt. the fault has not been rectified. Possible cause 2: Faulty electric motor on HTF pump. Possible cause 3: Temporar y error. fault has not been rectified. 2. Monitor to see if fault clears. Possible cause 2: The filter on the collector circuit is blocked. 2. Clean the filter if necessary. 3. Press the Ackn. button. Possible cause 3: Air in the collector system. 2. Check the expansion vessel. 3. Fill with fluid if necessary. 4. Listen for air in the system. If air is heard constantly, contact the Technical Support Department. anti-freeze in the collector circuit. time periods of 3-4 weeks). Possible cause 6: Lack of refrigerant in the refrigerant circuit. 2. Wait for the heat pump to start. Possible cause 1: Insufficient primar y flow over the heat pump. the speed of the heating system pump. Possible cause 2: The filter on the primar y circuit is blocked. 3. Clean the filter if necessary. Possible cause 3: Air in the primar y circuit. 2. Check whether there is air in the radiators/underfloor circuit. 3. Fill the heating system and vent if necessary. when you hear a clicking sound. 3. Check that the filter on the primary circuit is clean. buttons on the heat pump. pump or a blocked filter. sensors T8 (GT8) and T9 (GT9) is too high. Possible cause 1: Insufficient flow over the heat pump. 1. Check that the heating system pump has not jammed. systems at least half of the coils should be fully open. 3. Increase the speed of the heating system pump. bypass and an external main pump G1(P1). Possible cause 1: The temperature setting is too high. Possible cause 2: The hot water temperature is set too high. 2. Press the Ackn. button. the flow in the heating system. of the water going out to the heating system becomes too high. under heading Read the temperatures on the heat pump. Possible cause 1: Temporar y error. 1. Monitor performance of the heat pump. Possible cause 2: Short circuit or broken sensor cable. sensor table in the section Technical information. the resistance of the cable. Possible cause 3: Defective sensor or incorrect connection. Possible cause 1: Temporar y low heat transfer fluid temperature. Possible cause 2: Too low flow on the collector circuit. 2. Clean the filter if it is blocked. Data at 0/45°C according to the European standard EN 14511. Data applies to a new unit with clean heat exchangers. aM type fuse, D characteristic MCB. Measurement according to EN ISO 3743-2. Calculated values at 1 m distance according to EN ISO 11203.